It was cool and overcast this morning, so we decided to bring Tessa with us when we went to Keady market. 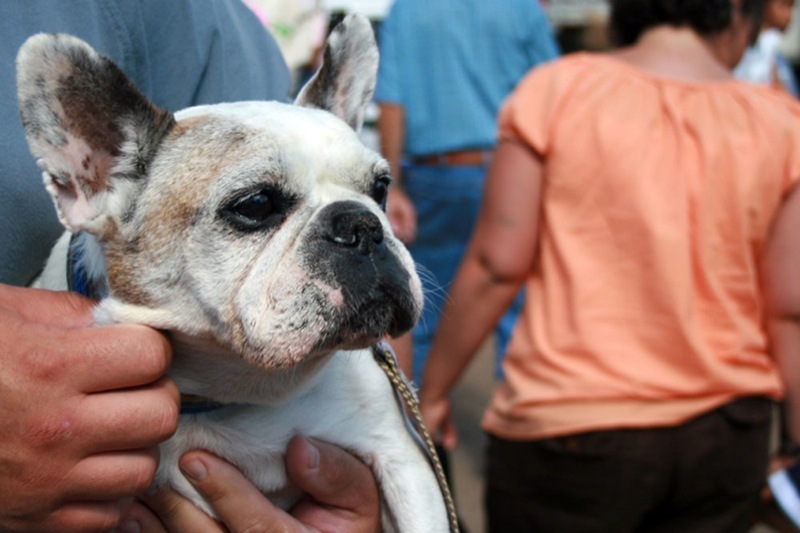 It’s very dog friendly – lots of people bring their dogs with them, and so long as you avoid the livestock areas, there’s no problems taking them through the entire market. The market today was the most crowded I’ve ever seen it – a combination of nice weather and prime tourist season, I suppose. 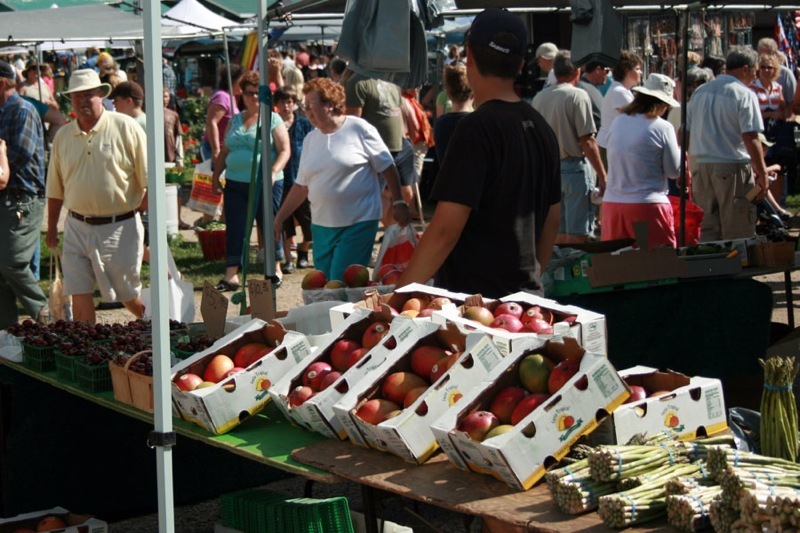 Keady is right on the road north to Tobermory, a popular tourist spot, and a lot of local literature pumps it up as a ‘great place to see real! live! farm animals! It was wall to wall people, with more than the usual complement of ‘free kitten’ hawkers present. What’s with that, anyways? Why would you haul your yard bred kittens all the way to the market, and sit around all day waiting for someone to take them away, when you could just spay your cat? I don’t quite get the logic in that. Our ‘own’ cat, Petal, has some rather strange secret life that Sean and I haven’t quite figured out yet. She comes to our porch for her meals, twice daily and as regular as clockwork. Seriously, you can almost set your clock by her, she’s so regular. What’s strange, though, is that we have no idea where she goes for the rest of the day. We’ve seen her trotting across the road, apparently from our neighbour the bucket hoarder. We’ve speculated that she’s actually their cat – she seems to live there. If so, why don’t they feed her? 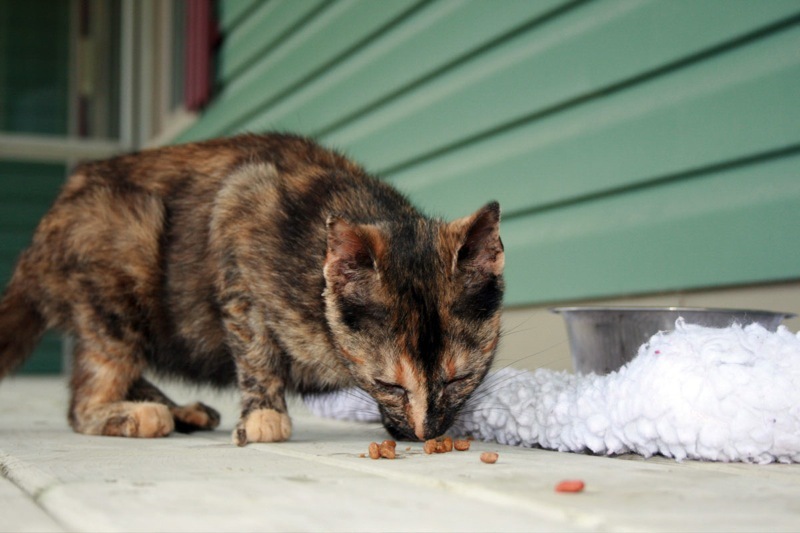 They can’t possibly be feeding her, we’re sure of it – she chows down simply incredible amounts of food when she’s at our place, and she was skinny and malnourished when we first noticed her. She was also covered in fleas, which we treated her for. So, if she is their cat, she’s not being well cared for, which means I should have no qualms about simply taking her and making her into an indoor cat, right? It’s not so simple, however, in large part because the bucket guy sort of scares me a little bit, seeing as how he’s kind of a hermit and we only ever see him when he drives down the driveway to get his mail (which he does from inside his truck). Sean doesn’t want confrontation with him, partially because he might be crazy, and partially because he’s our closest neighbour. For now, then, Petal comes here for her meals, and goes wherever it is she goes in between. This is going to have to change come winter time, however, as I can’t stand the thought of her being out there in the cold. I have an appointment to take her in for a spay next week, and don’t see why she can’t just stay inside the house for good afterwards. Outside cats disappear all the time, right? Today at Keady was the first time that Tessa really seemed unhappy out in public. She didn’t seem comfortable in the crowds – she kept getting confused, and worried when she couldn’t see me. Finally Sean just picked her up and carried her, which she accepted as her Princess-like due, and which gave her a great view of the livestock areas. I think that might have been her last trip to anyplace so crowded and busy, as she really didn’t seem to enjoy it, and I couldn’t relax because she was so stressed out. I think from now on I’ll stick to bringing her places that are less crowded, like the ice cream stand, and for short walks in Durham. Farmer’s markets and other places with big crowds just aren’t enjoyable for her anymore, and Tessa’s happiness is incredibly important to me. 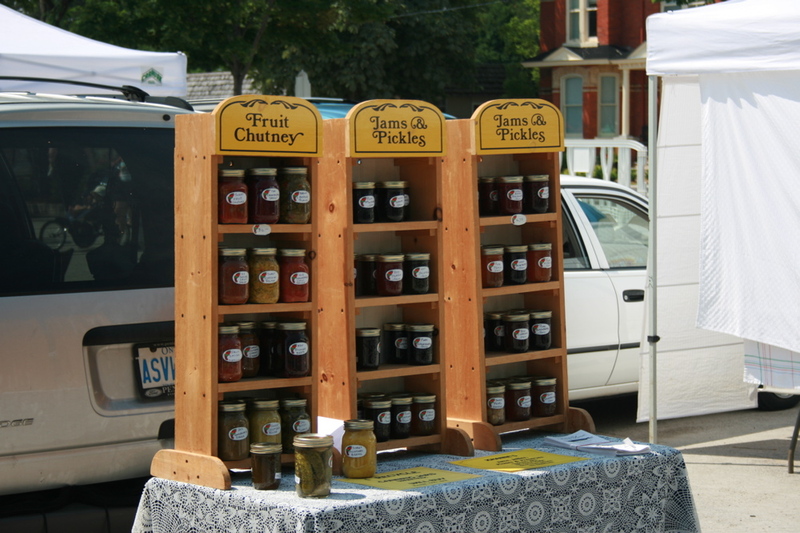 Sean and I spent Saturday in Collingwood, at the organic Farmer’s market. The usual assortment of goods awaited us – locally grown organic vegetables (other than strawberries, not much local fruit is in season yet), grass raised beef and pork, kitschy wooden goods (including some cute pet bowl stands that my dogs would chew through in about an hour), and a young girl leading a Native(ish) drum circle. Call me cynical, but I start giggling when I see very earnest young people talking about connecting with ‘mother earth and sister sky’ while they pound on a drum. Speeches, no matter how well intentioned, about ‘letting the spirit of our people flow through us’ become hard to take when delivered in the middle of downtown Collingwood (quite possibly the whitest place in Ontario) by a blond girl with dreads. Plus, hippies make me itchy. We bought some awesome plum jam, and a jar of peach chutney. I am enough of a displaced Brit that I still think chutney is the perfect accompaniment to a roast beef sandwich, whereas Sean thinks chutney is made by the devil. He swears it smells like brimstone, which is pretty tough words coming from a man who eats Haggis of his own free will. We then grabbed some local brie and a really great loaf of chewy bread, and ate lunch over looking Nottawasaga Bay. Our drive to Collingwood is through some of southern Ontario’s most beautiful scenery. We pass though the Grey Highlands and into the Blue Mountains, avoiding the main roads for the scenic routes. We had to stop to allow a very fat, very cranky porcupine to amble his way off the gravel and into the shrubbery, while I fumbled for the camera and contemplated whether or not porkies really can toss their quills. By the time I found it, he was off into the woods. 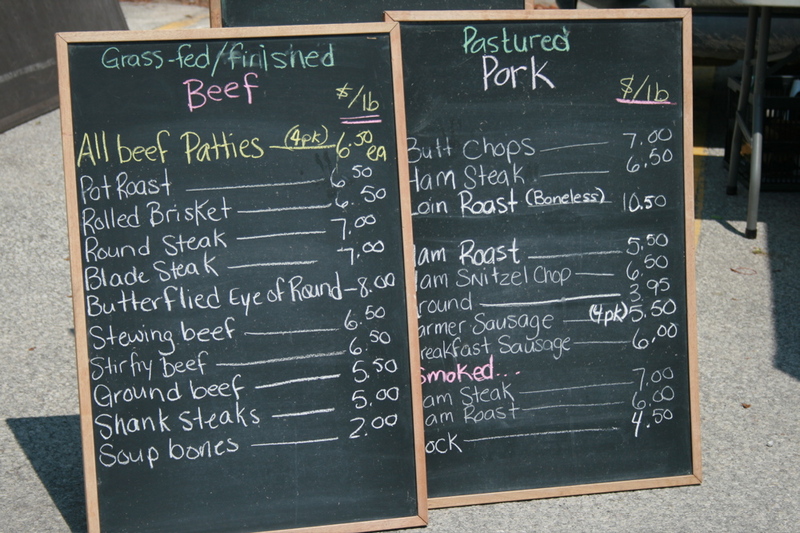 Tomorrow is Tuesday, and since Sean is off we’re going to head up to my favorite market, Keady. It’s a combination livestock market and Farmer’s market, and last time we went I was thisclose to coming home with a goat. In my defense, it was a super nice goat – very affectionate and dog like. I’m pretty sure I could fit a goat into the back of the Element. It would be nice for Delilah to have a friend.